Experience the terror of Raccoon City as heroes Chris Redfield and Jill Valentine try to survive a mansion filled with flesh hungry zombies, giant spiders, horrific amphibious creatures, mutant dogs and worse. 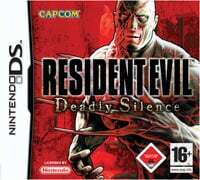 Now the Survival Horror Classic Resident Evil® debuts with features exclusive to the Nintendo DS™. # Two Great Ways to Play! Game score 7.035 / 10 calculated out of 76 players' votes. Expectations before the premiere: 10 / 10 calculated out of 2 players' votes.